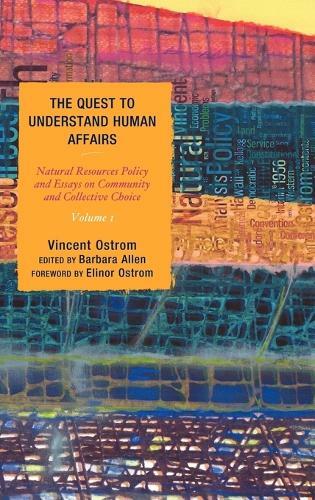 The Quest to Understand Human Affairs presents fifty previously unpublished essays by Vincent Ostrom on the U.S. Government's environmental problems and resource governance and span the six decades of Ostrom's career in political science and public administration. Including everything from a 1947 essay on Western (U.S) issues in national politics to ending with a 2004 manuscript on Constitutional foundations and federal institutional forms, these essays examine significant developments in administration, constitutional design, and the evolution of theory and practice in the field of institutional analysis and development during the second half of the twentieth century and first decade of the new millennium. Political theorist, Barbara Allen, has edited the work and provided extensive notes that provide context and identify key events and persons cited in the works. These remarkable works not only offer specialists insight into developments in the fields of institutional analysis, resource governance, policy and administration, but also speak to general readers about worldwide transformations in democracies and human and environmental relations as well as the enduring challenge of sustaining just, productive political orders.